Besides visiting the Philippine Department of Agriculture on February 20, His Excellency Dr. Sokhun of MAFF (third from left) also came to IRRI to discuss expanding Cambodia’s seed systems as it is preparing to position itself as a rice exporter. Also in photo are Dr. Ouk Makara, CARDI director; Dr. Hean Vanhan, GDA director general; Dr. Matthew Morell, IRRI director general; Mr. Ngin Chhay, DRC director; Dr. Bruce Tolentino, IRRI head for communication and partnerships; and Dr. Abdelbagi Ismail, STRASA project leader. LOS BAÑOS, Philippines—Cambodia is seeking ways to considerably increase its annual rice production in the next 10 years. This was the focus of the discussions between Cambodia's senior agriculture officials and scientists from the International Rice Research Institute (IRRI) on 21 February at IRRI headquarters. 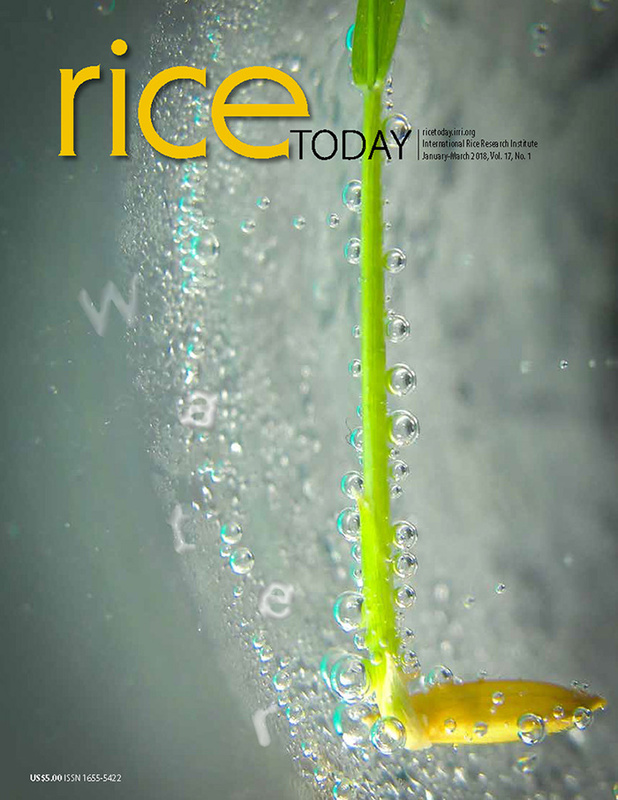 "The most important priorities for the country right now are the seed systems and varieties that can adapt to drought, flooding, and other stresses caused by climate change," said Mr. Ngin Chhay, director of the Department of Rice Crops at the General Directorate of Agriculture (GDA) of Cambodia. Dr. Abdelbagi Ismail, the leader of the Stress-tolerant Rice for Africa and South Asia project, briefed the officials on “Accelerating the Adoption for Stress-Tolerant Varieties by smallholder farmers in Cambodia (ASTV), a project he also leads and is supported by the United States Agency for International Development. "IRRI is pursuing this opportunity because of the success and impact these climate-resilient rice varieties had in South Asia,” he said. “Our hope is to repeat this success in Cambodia and see how these varieties can really make a difference for farmers’ livelihoods and food security in the country." To facilitate the distribution of seeds and the targeting of appropriate varieties to specific environments, IRRI is conducting the Remote sensing-based Information and Insurance for Crops in Emerging economies (RIICE) project in the country. 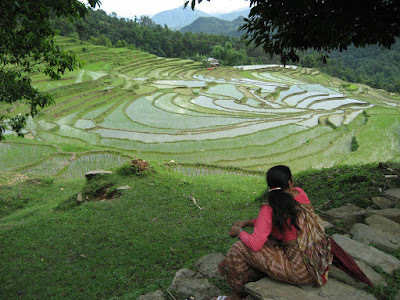 "In RIICE, we monitor the rice areas every season," said Dr. Nasreen Khan, head of the GIS lab at IRRI. "We use radar technology that can penetrate clouds. Every 12 days, we get satellite images to help analyze and map rice production areas. The project also provides estimates of yields in the middle and the end of the season for local monitoring." Dr. Yoichiro Kato, an agronomist at IRRI, stressed the important role of crop and nutrient management practices for increasing productivity. “Besides improving the seed systems and developing new enabling policies, we also need to improve farmer’s management practices to maximize rice production,” he noted. Over the past years, IRRI has been working with the Cambodian Agricultural Research and Development Institute (CARDI) to not only develop improved rice varieties, but also assess the impact of best management practices with improved rice varieties. On-farm demonstrations of CARDI and IRRI across 192 sites showed that rice farmers can harvest an additional ton when new varieties are combined with best management practices on nutrients and pest control. Moreover, farmers' net income also increased. The IRRI-led Ecologically-based Participatory IPM Package for rice in Cambodia project aims to develop site-specific, environment-friendly integrated pest management (IPM) packages for rice farmers in the country. Postharvest management and technologies are also critical to Cambodia’s goal of becoming a major rice exporter. "Postharvest issues are playing an increasingly important role in Cambodia,” said Secretary of State H.E. Ty Sokhun of the Ministry of Agriculture, Forestry and Fisheries. “We still command a competitive price at the farm level, but our concern is transportation and processing." Engr. Martin Gummert, IRRI postharvest and farm mechanization expert, shared an overview of how IRRI has been working with Cambodian farmers and industry leaders on different postharvest technologies since 2005. Some of the technologies that have been introduced include combine harvesters, flatbed dryers, laser levelers, hermetic storage systems, and others. In 2016, the Royal Government of Cambodia and IRRI celebrated 30 years of working together to secure the country’s food and develop its rice sector. Prior to their IRRI visit, Sec. Sokhun and his party met with the Philippine Department of Agriculture Secretary Emmanuel Piñol in Manila to discuss and learn from the seed systems in the Philippines and touch bases on trade between the two countries; the Philippines will import rice from Cambodia while Cambodia will import poultry and pork from the Philippines. The visit was facilitated by the ASTV project. Dr. Georgina Vergara, ASTV scientist based in Cambodia, joined the Cambodian delegation. LOS BAÑOS, Philippines – “IRRI has made a real difference in people’s lives by combating famine and malnutrition,” said a representative from the Community Liaison Office of the U.S. Embassy in the Philippines. “We have heard so much about IRRI, and it’s nice to finally visit for ourselves and have a greater appreciation for rice and what the institute does.” The delegation visited IRRI headquarters on 19 February to know more about rice science and food security. 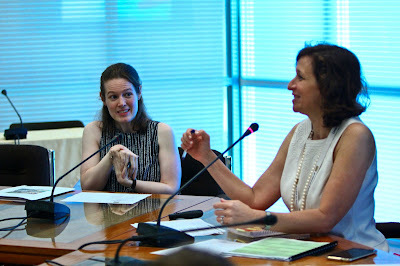 Michele Weldon, head of Partnerships and Development, presented an overview of the institute’s agenda. She emphasized IRRI’s role as an agricultural global convener, working in partnership with different countries through their respective national agricultural research and extension system. The party also visited the Long-Term Continuous Cropping Experiment, the Riceworld Museum, and the International Rice Genebank, which holds in trust the world's largest collection of rice varieties. To date, the Genebank has received more than 5,500 types of rice from IRRI’s U.S. partners. Weldon also acknowledged the significant role of the U.S. Government when IRRI was established in 1960s by the Ford and Rockefeller Foundations and in the development of the high-yielding variety IR8 that sparked the Green Revolution. The U.S. continues to work with IRRI in developing rice varieties tolerant of drought, flooding, heat, cold and other environmental stresses and in conserving rice genetic diversity. “As an American, I wanted to share how the U.S. helped combat famine and poverty in the world and promote food security through scientific research,” Weldon said. "Please spread the word to your colleagues that, here at IRRI, we are very grateful to the U.S. for its contributions and the long partnership that helped us carry out this valuable work for rice farmers and consumers around the world." AMARAVATHI, India - A satellite-based rice monitoring system, capable of collecting detailed and accurate data on rice production, will soon be operational in the state of Andhra Pradesh. The State Government on 9 February 2017 entered into an agreement for this purpose with the Philippines-based International Rice Research Institute (IRRI), which its Director General Matthew Morell said will provide technical support for the technology that drives the system (photo above). The rice monitoring system was pioneered by IRRI and the Philippine Department of Agriculture for the collection of accurate and up-to-date information on the country’s rice production. It has made information on Philippine rice production readily accessible to decision makers and has helped government agencies respond better during and after natural disasters. Andhra Pradesh officials want to achieve the same in the State, almost half of which are areas vulnerable to cyclones, storm surges, flooding, and drought. “Use of this IRRI technology will ensure better results in estimating crop losses in case of natural calamities,” said Prathipati Pulla Rao, minister for Agriculture, Agri-Processing, Marketing, and Warehousing, Animal Husbandry, Dairy Development, and Fisheries. Budithi Rajesekhar, secretary to the Government for the Department of Agriculture and Cooperation, believes the system will be crucial for rolling out crop insurance products to rice farmers in Andhra Pradesh. “The farmers will benefit from timely insurance payouts in instances of crop loss,” he said. The system will be institutionalized within the State Department of Agriculture (DA) and Acharya N. G. Ranga Agricultural University (ANGRAU), the State’s agriculture university. A sustainability plan will be developed for the handover to DA and ANGRAU of the operation and maintenance of the system by end of 2019. IRRI will continue to provide support post-project operationalization. (L-R) C. Roul, ICAR secretary and DARE additional secretary; T. Mohapatra, ICAR director general and DARE secretary; Matthew Morell, IRRI director general; and J.S. Sandhu, ICAR deputy director general for crop science. 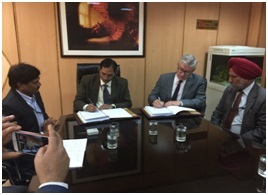 NEW DELHI, India – A new work plan was signed this month between the Indian Council of Agricultural Research (ICAR) and the International Rice Research Institute (IRRI), outlining an “exciting and forward-looking” research and development partnership that will enhance India’s rice sector. India remains a top producer and consumer of rice globally, and is now among the world’s top rice exporters. Its harvesting area is the largest in the world, but large swathes of it are increasingly affected by climate change. The collaborative work plan for 2017-2022 includes new projects that seek solutions for better managing environmental resources, climate change, and sustainability of rice production to meet future demand. These will involve upstream research on crop genetic improvement and intensive rice-based systems. There is also a new focus on nutrition, gender equality, and creating attractive opportunities in the rice sector for the youth. The work plan includes four ongoing projects on sustainable farming, improving extension systems, mechanization, and the development of a future rice strategy for India. The ICAR-IRRI collaborative work plan for 2017-2022 was signed by T. Mohapatra, director general of ICAR and secretary of India’s Department of Agricultural Research and Education; and IRRI Director General Matthew Morell. LOS BAÑOS, Philippines—Twenty-five senior agriculture officials and specialists from Nepal visited the International Rice Research Institute (IRRI) to learn about its impact-driven work and training opportunities. The delegation included members of the High Mountain Agribusiness and Livelihood Improvement (HIMALI), a project that aims to promote agribusiness development in the country’s high mountain districts. Mr. Ram Mani Paudyal, a project team leader at HIMALI, is trying to help make farmers in the highlands become more entrepreneurial by providing agribusiness grant opportunities, empower farmers to add value to their products, and strengthen market linkages. But an erratic monsoon pattern due to climate change is affecting the country’s farmers. In particular, water for crop irrigation is becoming a major problem. “Sometimes we have plenty of rainfall, other times we have little rainfall,” said Mr. Dala Ram Pradham, another HIMALI project team leader. “Then there are times when we have no rainfall at all." Dr. Peter Brothers, head of IRRI Education, explained how IRRI is developing different kinds of rice varieties to help countries like Nepal adapt to the complexities of climate change. "What you have cited is very common," he said. "There are several areas of work that IRRI is pursuing. One is developing varieties that are drought-tolerant, flood-tolerant, saline-tolerant, heat-tolerant, and even cold-tolerant. "The other is water management,” Brothers explained. “We have scientists working on alternate wetting and drying system to help farmers cut water use without reducing yields,"
He also shared how he recently received a request from a seed grower's group in Nepal to design a course on quality seed production. The visit by the Nepal delegation to IRRI on 7 February was organized by the Philippine Council for Agriculture, Aquatic, and Natural Resources Research and Development.